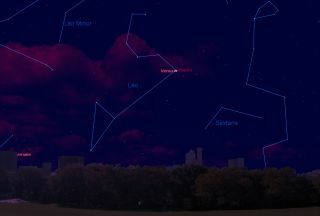 This sky map shows the location of brilliant planet Venus and the bright star Regulus in the pre-dawn sky on Oct. 3, 2012, as viewed from mid-northern latitudes. Regulus is a bright star seen in the constellation Leo. It's the brightest star in the constellation and among the brightest in Earth's night sky. The star has two known companions nearby, a set of binary stars, but observations in the past few years suggest there may be a white dwarf lurking close to Regulus as well. Another mystery is the source of its extremely rapid spin and strange motion. Because Regulus can stray within the ecliptic, or the path upon which the sun and planets travel, it is very occasionally eclipsed by one of the planets or an asteroid. For example, in 1959, Regulus was occulted by Venus. In science fiction, Regulus has been used for television series such as "Star Trek" and "Babylon 5." Also, Regulus Black is the name of a character in the "Harry Potter" series by J.K. Rowling. He was the brother of Sirius Black, Harry's godfather, named for the brightest star in the sky. Astrophotographer John Chumack sent in a photo of Mars (red), Regulus (blue star) and the waning crescent moon in a triangle over his backyard observatory in Dayton, OH. Photo taken Oct. 1, 2013. The constellation Leo was mentioned in the Tetrabiblos, an ancient Roman text by Ptolemy (c. A.D. 100 – 170). The text dealt with astrology and the supposed effect of events in the sky on humanity. In Latin, the name "Regulus" means "little king." Regulus first received its name from the 16th-century astronomer Nicolaus Copernicus, the encyclopedia added, "marking the fact that it had been regarded as one of the leading stars in the sky for some 2,000 years." In Arabia, Regulus was referred to as Malikiyy, "the kingly one", according to stellar nomenclature expert Richard Hinckley Allen. Other ancient cultures also saw it as a herald of kingly power. Under modern classifications, Regulus is considered a blue-white "B" star that lies on the main sequence of stellar evolution. While Regulus, like the sun, fuses hydrogen to helium in its center, it is more massive than the sun and therefore hotter and brighter. Unseen by the naked eye are two very faint companions to the much larger bright star. The binary pair (two dwarfs, orange and red) are about 4,200 Earth-sun distances (astronomical units, or AU) away from Regulus and take about 130,000 years to complete one orbit, Darling said. The dwarfs are about 95 AUs apart, more than three times the average distance between Neptune and the sun. There is probably another companion as well, according to one research team that did measurements of the spin of Regulus. Variations in the spin of the star mean there is probably a white dwarf, or dead star, lurking in the vicinity of Regulus, the astronomers argued in 2008. "A companion ... may be a low mass white dwarf or main sequence star," a preprint version of the research paper read. "If Regulus was spun up by mass transfer in an interacting binary, then the remnant of the donor star is probably a low mass white dwarf ... Indeed, the lowest mass white dwarfs are usually found in binary systems where they lost a significant fraction of their mass." Astronomers had a detailed look at Regulus' motion in a study published in 2005, showing that the star would only need to rotate about 10 percent faster to tear itself to pieces. They added, however, that they couldn't see anything in the system that would cause it to move faster. "There's nothing that we know of that can speed this star up," said Georgia State University astronomer Hal McAlister, who led the study of the star at the university's Center for High Angular Resolution (CHARA), in an interview at the time. The rotation of Regulus speeds at 700,000 mph (1.1 million kph) at its equator. (The sun's rotation is about 4,500 mph or 7,242 kph.) The 2005 study examined the effects of the rotation for the first time using the CHARA telescope array on top of Mount Wilson in California. Among the odd effects on the star: Regulus is much hotter at its poles (27,212 F, or 15,100 C) than its equator (18,032 F or 10,000 C). This is because the star is so distorted that it lessens gravity's strength, which then turns down the temperature at the equator, the researchers said. As for what causes the rapid rotation, astronomers at the time said it was a mystery. "We don't have any idea why it's really doing that," McAlister said. "The picture makes me wonder what it would be like to be in a solar system with this type of star."